European singles vice champion from Danish city Herning 2012, and champion in doubles event one year latter in Austria, Croatia’s TAN Ruiwu will replace SHIBAEV. SHIBAEV already came as a replacement for Marcos FREITAS of Portugal. The 2014 Asia-Euro All Stars Challenge will be staged on October 31 to November 1 in Zhang Jia Gang, Jiagang Gymnasium. For Europe also will play Bastian STEGER of Germany currently ranked at position no. 18 at the World rankings, no. 7 in Europe; Panagiotis GIONIS of Greece World’s no 21, Europe’s no.9, Adrian CRISAN of Romania World’s no. 28, Europe’s no. 11, Robert GARDOS of Austria no. 26, Europe’s 10 and SHIBAEV World’s no. 37 and Europe’s no. 13. SHIBAEV never played in at the Asia-Euro All Stars Challenge. For Asia will play XU Xin of China World’s no. one, CHUANG Chih-Yuan of Taipei World’s no. 8, Jun MIZUTANI of Japan no. 7, GAO Ning of Singapore World’s no. 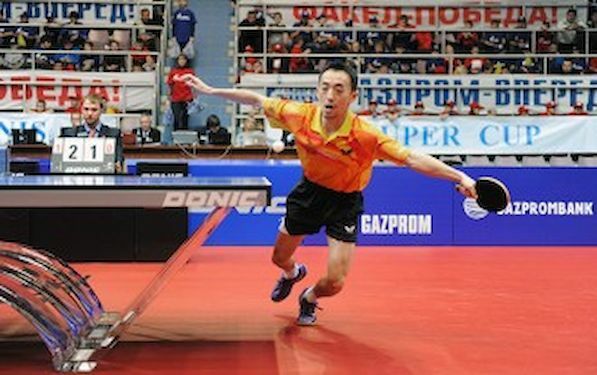 13 and TANG Peng of Hong Kong currently ranked at the position no. 16. The head coach is Richard PRAUSE. ETTU President Ronald KRAMER will also be on the event with special guest, Greek TTA President Emmanouil KOLYMPADIS and Team Manager Roman PLESE. The press conference and draw ceremony of the competition will be held on Oct. 30th 17 at the official Hotel.